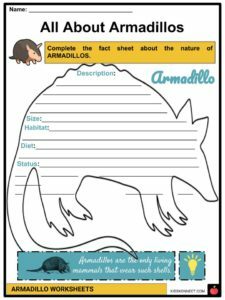 An armadillo is an omnivorous mammal native to Central and South America. 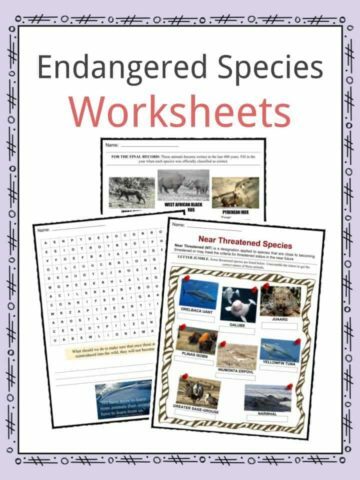 There are 21 existing species and only one is found in the United States. Armadillos are barrel-shaped animals covered with natural armor. Its name is a Spanish word meaning “little armored one”. It refers to the bony plates that cover the back, head, legs, and tail of most of these odd looking creatures. They are also known as the “Hillbilly Speed Bump” for their tendency to get run over by vehicles. 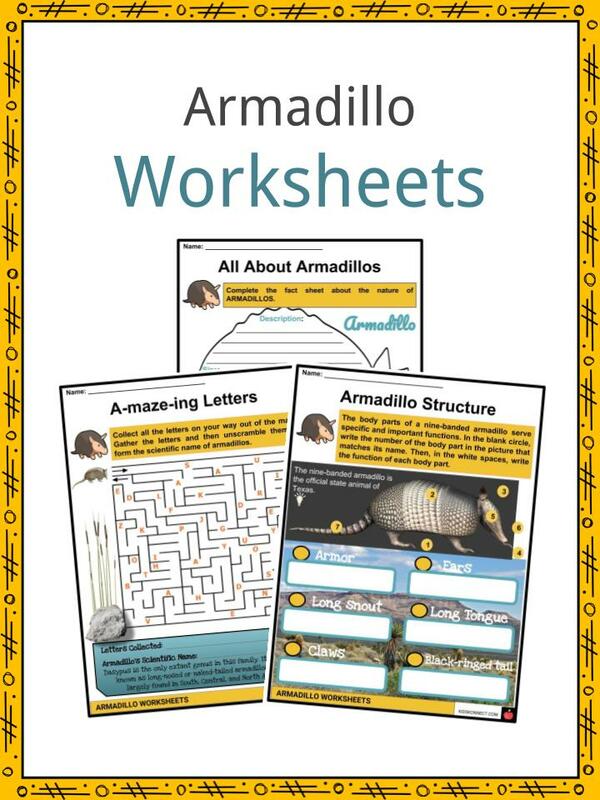 See the fact file below for more information on the armadillos or alternatively, you can download our 21-page Armadillo worksheet pack to utilise within the classroom or home environment. 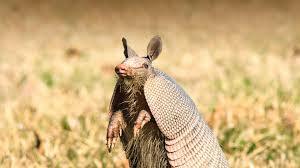 According to National Geographic, some armadillos are very small, while others are huge. The pink fairy armadillo, which is about 6 inches (15 centimeters) long is the smallest. Giant armadillos are the largest species, and are about 5 feet (1.5 meters) long. 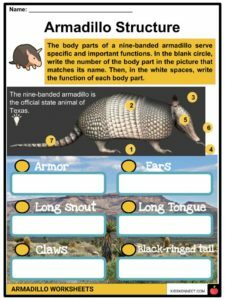 An armadillo’s armor is made up of overlapping plates covering the back, head, legs, and tail. Only the three-banded armadillo can roll itself into a hard armored ball when endangered. Other armadillo species simply dig a hole quickly and hunker down so that their tender stomach is protected and their armor is the only thing visible. 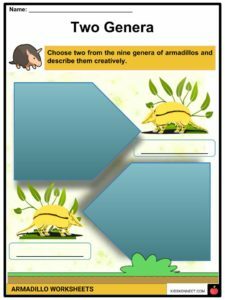 Armadillos have pointed snouts and long, sticky tongues, similar to anteaters, which are close cousins. Their eyesight is poor, so they hunt with a highly developed sense of smell. They also have wiry hairs along their sides and belly, which they use to feel their way around, like curb feelers on some cars. They also have strong legs and sharp claws for digging. Due to their lack of fat stores, most armadillos stick to areas closer to the equator because they like temperate to warm areas. Usually, armadillos prefer sandy or loam soils that are loose and porous, including rain forests, grasslands, and semi-deserts. This makes digging for food and creating burrows easier. 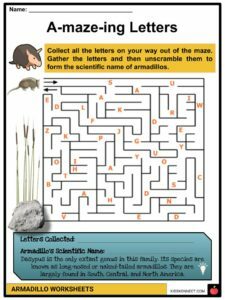 Armadillos are omnivores, which means they eat meat and plants, though 90% of an armadillo’s diet is made up of insects and larvae. Most species dig burrows and sleep prolifically, up to 16 hours per day, foraging in the early morning and evening for food. Because they have very poor eyesight, they utilize their keen sense of smell to hunt. With their long, sticky tongue, armadillos catch ants, beetles, termites, and other insects after digging them out of the ground. 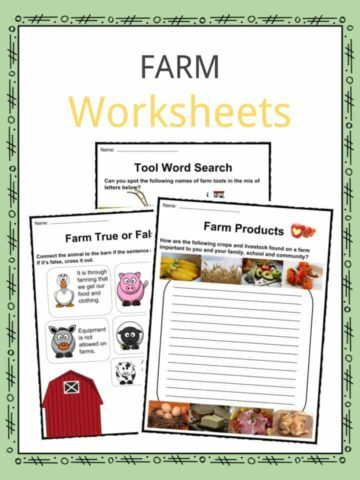 They also eat plants, eggs, small vertebrates, and some fruit. From time to time, they will scavenge for dead animals. After a gestation period of two to five months, the female will give birth to one to 12 young in a birthing burrow. These burrows can be up to 15 feet (4.5 m) wide. Baby armadillos are called pups. Twin births are common according to the San Diego Zoo. 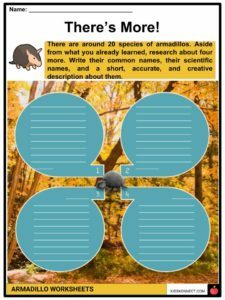 Nine-banded armadillos have four identical pups of the same gender in every litter, and the seven-banded armadillo has eight to 15 identical pups at one time. Pups mature quickly. They are weaned by two to four months. By nine to 12 months, the pups are mature and ready to have offspring of their own. Armadillos can live anywhere from four to 30 years. 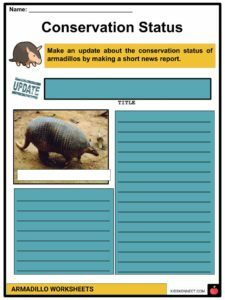 The median life expectancy for three-banded armadillos is around 16 years. Agitated armadillos are reported to made several kinds of sounds. The peludos, or hairy armadillos (three species of genus Chaetophractus), make snarling sounds. The mulita (D. hybridus) repeatedly utters a guttural monosyllabic sound, similar to the rapid fluttering sound of a human tongue. 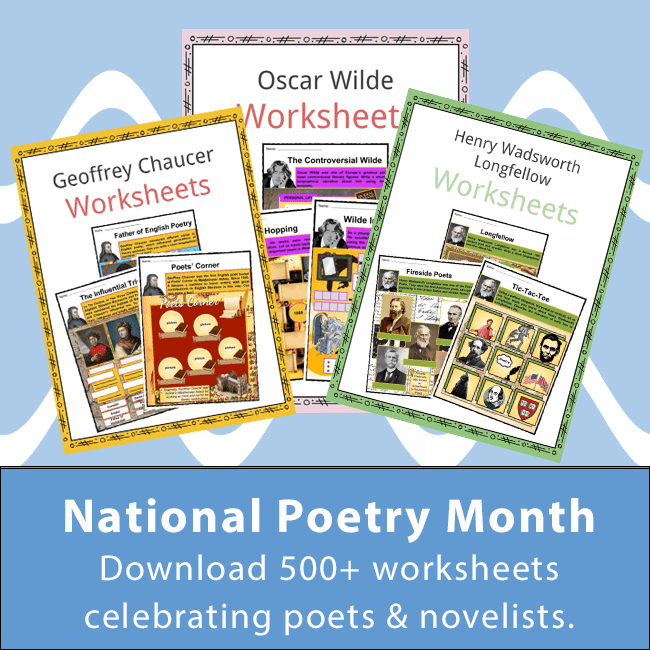 This is a fantastic bundle which includes everything you need to know about armadillo across 21 in-depth pages. 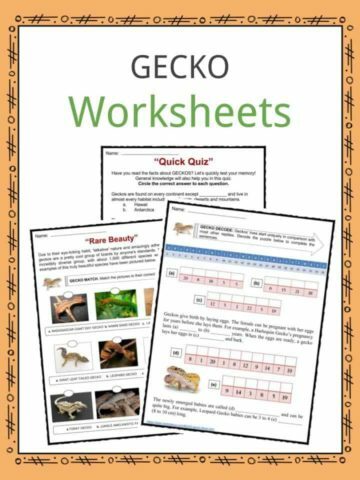 These are ready-to-use Armadillo worksheets that are perfect for teaching students about the armadillos which are barrel-shaped animals covered with natural armor. Its name is a Spanish word meaning “little armored one”. It refers to the bony plates that cover the back, head, legs, and tail of most of these odd looking creatures. They are also known as the “Hillbilly Speed Bump” for their tendency to get run over by vehicles.